Chocolate Toffee Christmas Crack Recipe – Called by its other name, Christmas Crack Candy, is an irresistible edible gift for the holidays! Gift-making season is the absolute best… Who’s with me? 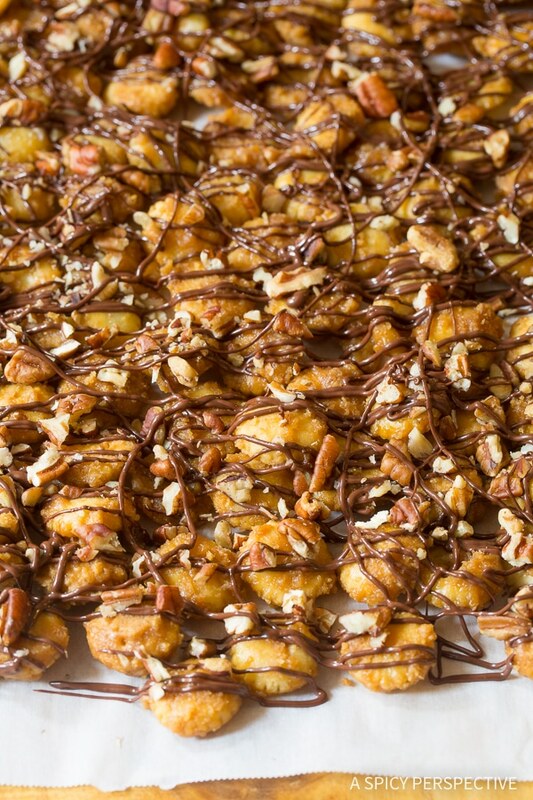 This Chocolate Toffee Christmas Crack Recipe makes the best sweet addicting present. The holidays give us an excuse to spoil our friends, stir up our creative mojo, and get in some much needed therapy cooking/baking all at the same time. Therapy Baking: The slow relaxed process of baking (or cooking) because you want to; not because you have to. It’s chill, anxiety-free, and makes you feel all warm and fuzzy on the inside. But I digress, edible gifts are my favorite kind of homemade gift because they can be enjoyed by the entire family. When you give someone a box of homemade peppermint fudge or soft bourbon caramels, you know that they are going to share the wealth with those they love. So when I give gifts I know are going to be shared, I secretly feel like a kindly puppet master, perpetuating good will and generosity to all. Today’s Chocolate Toffee Christmas Crack Recipe is the ultimate edible gift. 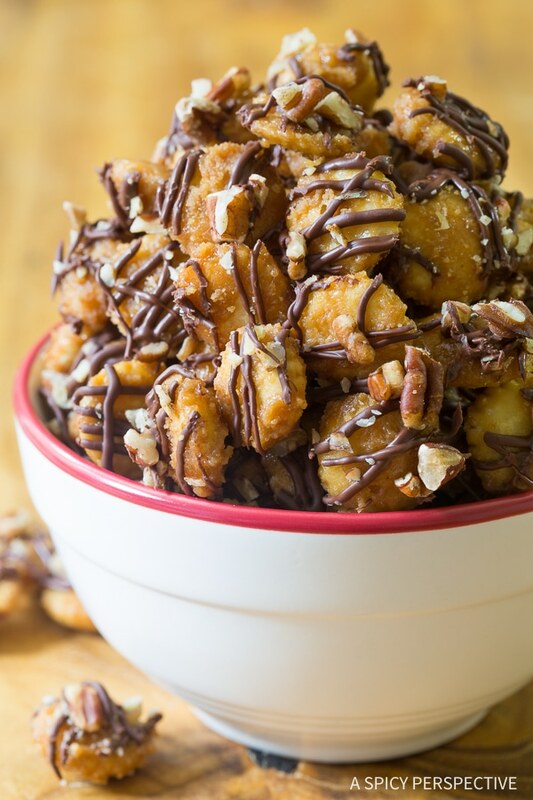 It’s rich, salty-sweet, crunchy, chocolatey, nutty, and totally irresistible. In fact, it’s as addictive as crack, some might say. I realize drugs of any kind are not a joking matter, but “Christmas Crack” does seem to be the dedicated name to this particular type of treat. So please forgive that fact that I’m going along with the trend. Traditional Christmas Crack (or saltine cracker toffee) consists of toffee poured over saltine crackers, then baked. The result is a devilishly addictive treat, both salty and sweet! 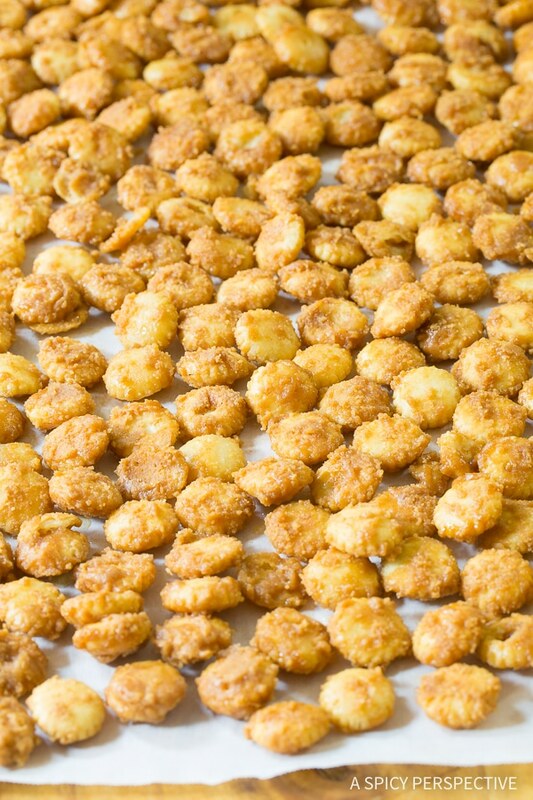 We decided we wanted to revamp the traditional method, making it a finger-popping snack you can munch in small pieces. Therefore, we made our Chocolate Toffee Christmas Crack Recipe with small oyster crackers, instead of saltines. And we made it entirely on the stovetop for quality control of the candy coating. B) Crank the heat up and wing it. 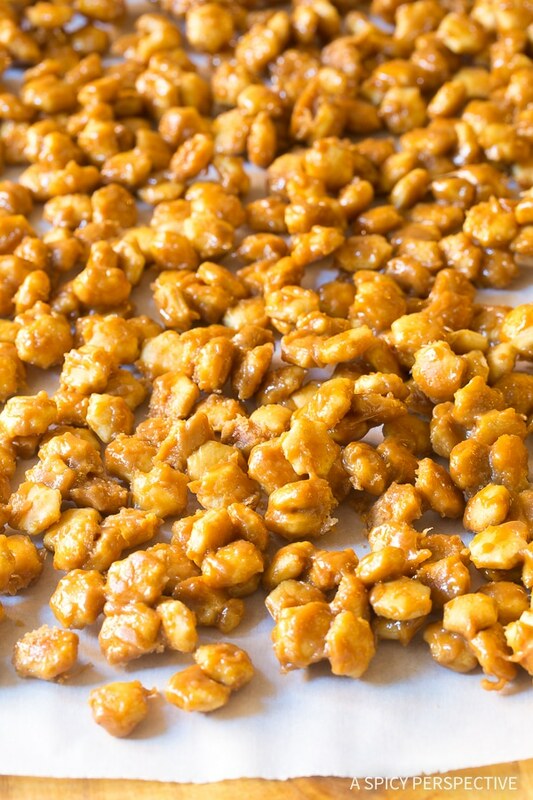 The problem with a lower “boiling-point” oven temperature is that sometimes it takes so long for the candy coating to get where it needs to be, that you over-bake the crackers, nuts, or anything else you are candying in the process. Whereas, when you turn the heat up high, trying to “candy” faster and not over bake, you risk missing the mark entirely. Therefore candy coatings are best made on the stovetop with a candy thermometer. That way, you can create the exact sheen and texture you desire. 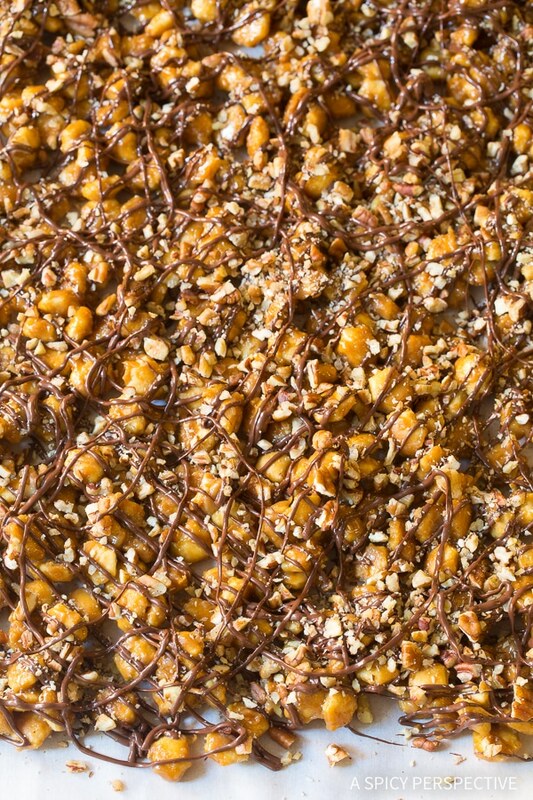 If you like hard shiny toffee coatings, make sure your toffee reaches between 300 – 305 degrees F.
If you like a less-glossy crumbly toffee texture shoot for 290 – 295 degrees F.
Toffee boiled to 290 degrees F.
Toffee boiled to 300 degrees F.
Once the toffee coating reaches the proper boiling temperature, stir in the oyster crackers, and dump them out on parchment paper to dry. 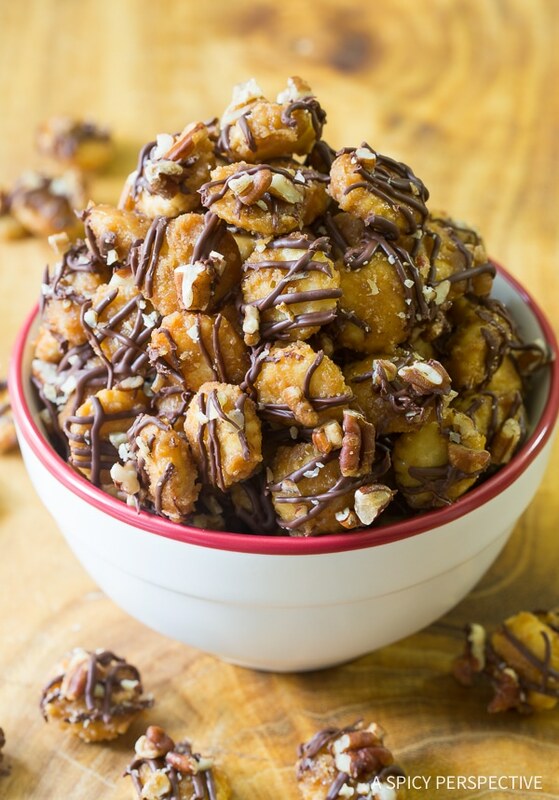 Then drizzle melted chocolate over the top and sprinkle the munch with your favorite nuts. After the chocolate dries, break the Chocolate Toffee Christmas Crack Recipe into pieces and package it up for friends and family! I’d bet money they’ll come around asking for more! How Quickly Can I Make Christmas Crack? Pretty fast! About 25-30 minutes, plus dry time. If you need the chocolate to dry faster, you can place the munch on baking sheets before drizzling it with chocolate, then place the baking sheets in the refrigerator. 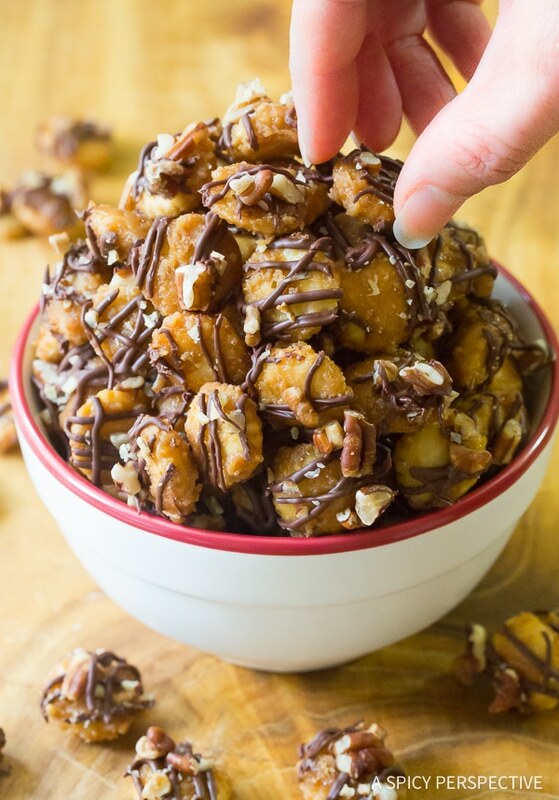 Can I Stir The Nuts Into The Candy Mixture With The Crackers? Absolutely! I’ve actually done that before. I just like the way the munch looks when you can see the nuts on top. Check Out Our Video In The Recipe Card Below For The Chocolate Toffee Christmas Crack Recipe. Enjoy! Chocolate Toffee Christmas Crack Recipe - Called by its other name Christmas crack candy is an irresistible edible gift for the holidays! Lay a large piece of parchment or wax paper on the counter. Place a large stockpot over medium heat. 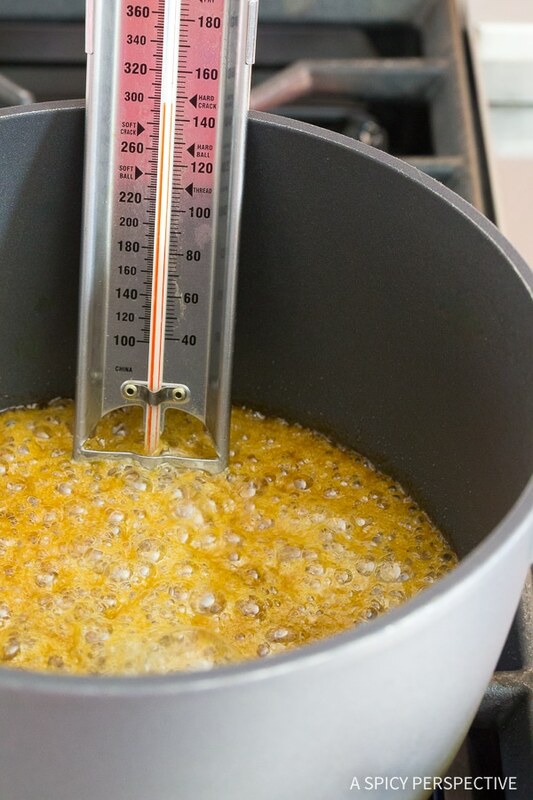 Attach a candy thermometer to the side, making sure the tip reaches the bottom of the pot. Add the butter, sugar, and salt. Bring the sugar mixture to a rolling simmer, stirring the entire time. 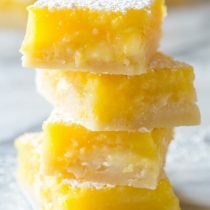 Continue gently stirring as it boils to keep the butter and sugar from separating, until the temperature reaches between 300-305 degreed F. If the butter and sugar separate, the candy will not have the proper texture. *Be careful; boiling sugar can be dangerous! Once you reach the desired temperature, immediately turn off the heat. Stir in the vanilla. Then gently pour in the oyster crackers and stir to coat well. Carefully, pour the crackers out on the parchment paper. Use a spatula to quickly separate the pieces, so they dry individually. **If your candy thermometer is accurate you reached the proper temperature, the candy will dry and harden on its own. It will have a light glossy sheen. If it stays sticky or looks crystalized, your candy thermometer is probably inaccurate. You can fix this by moving the candy onto a parchment paper lined baking sheet. Bake in a single layer at 450 degrees F for 5 minutes. Once the candy is completely cool, melt the chocolate chips. Either place them in a double-boiler over low heat, stirring until melted, or place in a microwave-safe boil, and nuke in one minute increments, stirring in between until completely melted. Place the melted chocolate in a plastic zip bag. Snip a tiny piece off one corner to create a piping bag. Then use the bag to drizzle chocolate over all the candy. While the chocolate is still soft, sprinkle the chopped nuts over the top. Let the chocolate dry until hard. 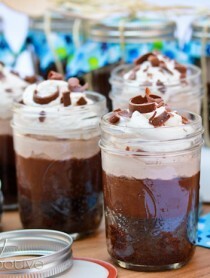 Once the chocolate is hard, break the candy apart and store in an airtight container for up to 2 weeks. For a less glossy crumbly toffee coating, shoot for a temperature of 290-295 degrees F. For a glossy hard toffee coating shoot for 300-305 degrees F.
OH My Goodness!!! So I made it and WOW! 5 Stars! 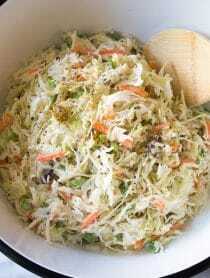 This baby will go in my recipes to hand down because once the kids get a hold of this with their Christmas goodies I KNOW they will want it every year. But me…I will have a secret stash of this on hand often or at least the ingredients in case I get a hankerin ;) Thank you for such a great recipe! 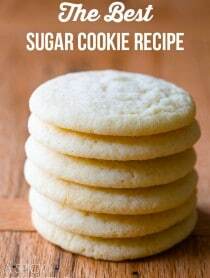 Your recipe has no sugar in it. I saw on the video that brown sugar was used, but there was no amount. This is an easy recipe and it tastes delicious. I took it to a party and it was a hit. This is good. Have you ever tried it with popcorn? I could have used another hand or two with getting the crackers separated before they cooled. But chunks are okay, too. 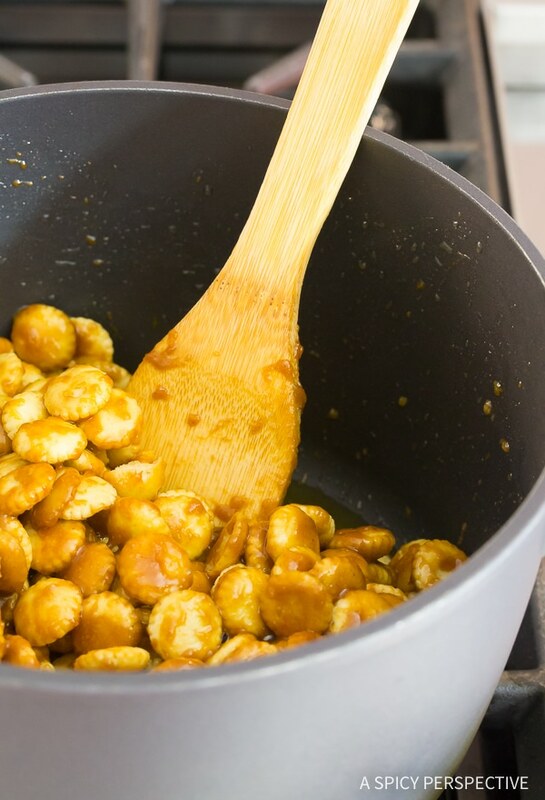 Easy to make and very tasty caramel. I made several batches then melted and drizzled the chocolate all at once. Have you ever made this with puff corn.? So easy, so tasty! Thanks for a great recipe! This was so easy! I found I really needed to keep stirring as it got close to 300 so it didn’t burn. I’d like to try with a bit or white chocolate drizzle too. Thanks for a great recipe! I’ve seen this made with saltines, but the oyster crackers make so much more sense! Thanks for sharing this. Oh my god this looks absolutely amazing! I think calling it “Christmas crack” is entirely necessary, because I’m assuming I could eat an entire batch without stopping for breath. Bookmarking this for sure! I too love giving out edible gifts, because they’re fun for me to make AND people love them. This is definitely being added to my “gift baking ideas”. And love your comment about “therapy baking”; I do that all the time! Your photos are absolutely gorgeous btw, love every single one and all the different perspectives and action shots you included! Heavenly!! I truly need this “crack” in my life!! Thanks for sharing the recipe, Sommer! I’m wondering if you could stir the nuts into the candy mixture with the crackers. I think that would be super delicious. Om my goodness! This must be the most addictive candy I’ve ever seen. How fast can I get this made up? The idea of the oyster crackers is mind-blowing! Thank you for sharing.